Do you like rubbish truck spotting? Do you laugh at burps and farts? Are you in the habit of making sounds like rarrrr or hrrrggghh at 100 decibels or more? Would you say that by-and-large most lawns just don't have enough holes in them? Do you consider a headlock to be a perfectly valid problem solving technique? Have you ever worn your undies on your head? The position of Mother is temporarily a bit vacant in our organisation. The current incumbent has taken leave of her senses absence to daydream of sugar and spice ... and pursue some pretty experimental experimental, pretty craft. Experience preferred, but not essential ( ... in fact, probably better that you don't know what you are letting yourself in for). The Pretty Craft Experiment comprises nine miniature canvases, inkjet printable cotton, batting, embroidery floss, pink and green fabric and the sewing machine. Depending upon the success of my recruitment drive, I hope to be able to show you more later in the week. Would I HAVE to watch Cars movie everyday at your place? If no then I'll considering swapping with you. Can't wait to see what you are up to. It sounds loverly. 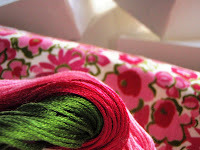 Miniature canvases, embroidery floss and one of my favourite colour combinations of pink and green. Can not wait to see the results of your Pretty Craft Experiment. Oh gee Liesl. You make it sound very tempting but unfortunately I've signed a contract of a minimum 15 years over here and I am NOT interested in a second job. Good luck with your employee search and experimental craftiness. Hi I would love to get a "real" job but I am afraid my current employee would not recommend me and I would probably only want to join in with you anyway. Gee I'm really sorry I've got my hands full here , can we swap ? I still feel like I'm a work experience student as a mother so suspect I would not fit the criteria! Well I'm not really looking for another job at the moment, although I'm sure it pays better than my current one! But hell yeah, you mean you don't do all those things? Come on, burps and farts ARE funny, all brrm brrm's are great, we should all wear our undies on our head from time to time and if all else fails....go for the headlock!!! Hmm, nope sorry, already the mum of 3 little boys, they'd probably play together ok, but I'd probably end up certifiable! Curious about how your ingredients will gather together to form art though! I would be a great candidate - I pointed out a digger when I was alone in the car earlier today, I am so in tune with big machinery and I cannot not laugh at burps and farts.